Conti´s Powertrain division will "clearly" not be able to post an unadjusted operating profit this year, CFO Wolfgang Schaefer said. German auto parts supplier Continental AG believes its troubled powertrain division could reach profitability on an underlying basis in 2010, its finance chief said today. "If the economic environment continues to develop as positively as it has for us in our automotive business, then breakeven can be reached this year, one year earlier than forecast," Wolfgang Schaefer said in an interview with Reuters. Powertrain, a business acquired as part of Continental's 11.4 billion euro takeover of Siemens VDO Automotive in December 2007, managed to post adjusted earnings before interest and taxes (EBIT) for the second time in as many quarters. The division had an operating loss of 943.2 million euros (about $1.23 billion) last year. In 2008, the operating loss was more than 1 billion euros. The division spent more than 110 million euros last year to close plants, cut costs, pay severance packages and reduce capacity. At a press event in June, powertrain division head Jose Avila said the unit's sales "will be nortah of 4 billion euros." Avila also told Automotive News Europe that his division is ahead of schedule with its turnaround and promised to meet Continental CEO Elmar Degenhart's target for the unit, which is to report an operating profit by 2011. Said Avila: "We are growing in Europe because of the new technologies we have in the powertrain area." CFO Schaefer said that due in part to investments for developing major parts of the drivetrain for a French automaker's electric car, the division will "clearly" not be able to post an unadjusted operating profit this year. "We certainly won't reach breakeven on a reported EBIT basis," Schaefer said. Continental declined to say which carmaker is the customer, but it is well-known that Renault plans to unleash a product offensive, including four electric cars, starting next year. Schaefer also said that any merger plans with controlling shareholder Schaeffler Group would be not affected simply by his company's geared balance sheet. 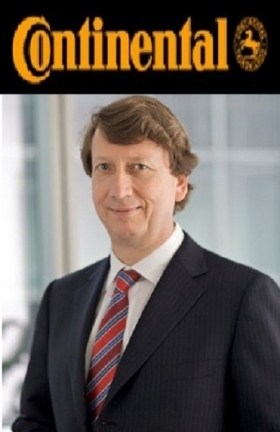 Continental aims to achieve an investment grade rating on a stand-alone basis, in other words excluding Schaeffler's operations, by the end of 2012. "If it makes sense to combine the businesses before then we will not make that dependent on how the credit ratings or debt level develops," he explained.